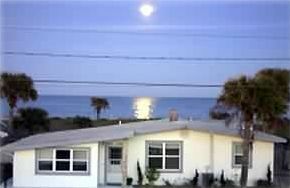 'Paradise ' Beach Home - Just Steps from Secluded Beach!!! Flagler Beach is the best of all worlds. This quaint little beach home is just steps from a secluded beach. It has a large backyard with ocean views and breezes. And there is a nice covered back porch to enjoy the sunrises. Flagler Beach has a farmers market every Friday and Saturday with a wide variety of fresh fruits and vegetables. Marineland (63 year old) is only 20 minutes away. There you can swim with the dolphins, snorkel, and scuba in the only 450,000 gallon ocean fed tank in the United States. Washington Oaks State Park is only ten minutes away... a breathtaking beach with giant Coquina rocks dotting the shoreline. And don't forget to view the exquisite gardens! We are located centrally to all of Florida's best destinations. World famous Daytona Beach is approximately 15 miles to the south, with all of the night life and action you can possibly handle. St. Augustine, the nation's oldest city, is approximately 30 minutes drive to the north. Orlando attractions are less than 90 minutes from your driveway. There are many clear water springs for swimming, snorkeling, diving, or camping. Water is 72 degrees year round. Great for manatee encounters during winter months. Kennedy Space Center is approximately a one hour drive south. But the best of all, is Flager Beach, (better known as real Florida). It has unspoiled and uncrowded beaches. When you are tired of all the crowds and YOU WILL BE, come home and relax at your very own peaceful part of PARADISE. * No Smoking inside... please, Pets considered with additional pet deposit. * A Reservation Deposit is required at the time of booking. * Weekly and monthly rentals available Year Round. * $100. cleaning fee required for weekly rentals. Many channels to choose from including H.B.O.